There are many things I like about having left suburbia Arizona for an old house on a few acres in Oregon. One of the best, is that I feel so much more in tune with the cycles of nature. Each season holds new and exciting changes: warm dry summers, blankets of heavy fog in the early winter, and the cold evenings and lush growth of spring. We look up at night and see an expanse of stars on inky black, not circling airplanes on muddy brown. For some reason, I even keep better track of the moon (about half full and waning). Unfortunately, our remodel-in-progress of a house leaks in a little too much nature when the temperature drops. This past week has been brutal, with outdoor temperatures never getting above freezing. We run the woodstove from morning until 2AM, and that keeps the second floor passably warm and the first floor downright cold. I’ve considered pulling the freezer thermometer out a few times to check the indoor temps, but decided against it. Best not to know. Water wasn’t freezing inside, so it must be above 32°. 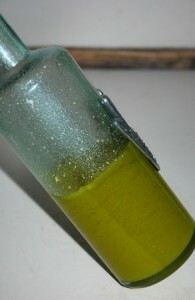 Today the bottle of olive oil on our kitchen counter caught my eye. It was the wrong color and also not clear. I picked it up, and realized that it wasn’t moving. Olive oil froze on our counter! Eeks. A little browsing online reveals that this occurs at refrigerator temperature, about 37°. So … on the plus side the produce setting out on our counter should keep well .. but I’m still looking forward to when a coat and gloves are no longer standard issue for first floor living. Yikes! I’ve never seen that before. You two are so brave. I do hope you can get things tightened up with your house real soon. Ok, that is cold inside! I hope the weather changes to warmer SOOOON for your sake! It froze on your counter? Mine freezes each winter in the cabinet above our stove, but that is due to the exhaust vent that runs behind that cabinet. It has never frozen on our counter, though. Bless your heart! Yeah, this cold snap hasn’t been very fun. I live indoors with my wool cap on along with my coat. My mom talks about how she would wake up in her parents old farm house and the cup of water by her bedside would be frozen. Then I think about that and how much nicer I have it compared to all the people a hundred years ago.